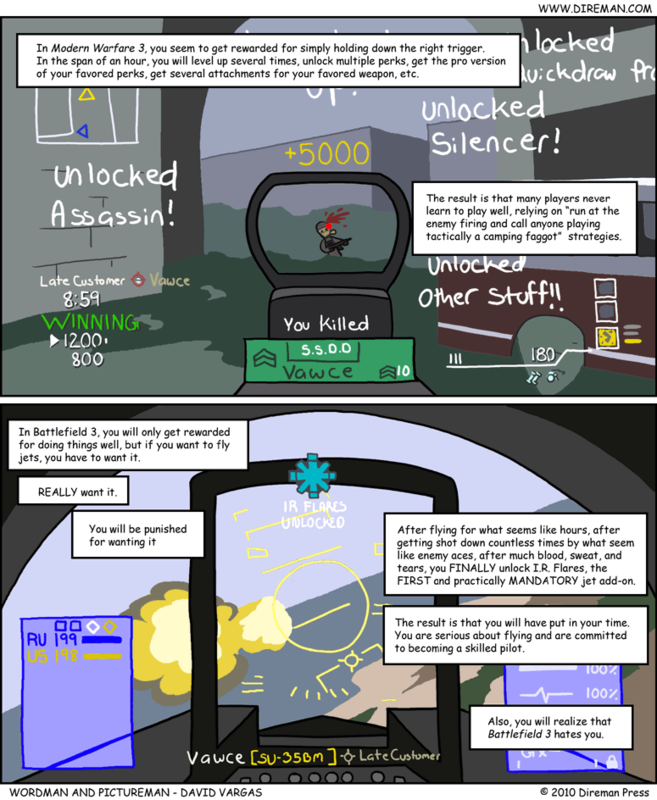 Those of you enraptured by first person military shooters have a legitimate second option now. Call of Duty is no longer the only marquee flavor. Me, I'm enthralled by the layers of additional combat actually piloting vehicles provides, as opposed to merely calling them in. The overall game-play in Battlefield 3 is excellent, and is easily a strong alternative to Modern Warfare 3. In Battlefield 3, suppressive fire works. Snipers snipe from every long ranges. Armor is terrifying if you have no anti-tank weapons on hand. Choppers provide air support while jets duke it out overhead. It's a great change of pace to Modern Warfare. Unfortunately, Battlefield 3 has nowhere NEAR the same amount of polish as Modern Warfare 3 does. The user interface seems archaic. You have to jump through hoops to play on the same team as your friends. For the life of me, I don't understand why the console versions use dedicated servers. It makes sense on PC, there's communities that spring up, plus games can support large numbers of players. On consoles, however, there's no community and the number of players in a game are too small to support dedicated servers. What ends up happening is that most games that should be 12 on 12 matches end up being, on average 6 on 6 affairs. Halo and Call of Duty's matchmaking at least all but guarantees full games. And yet, I still find myself wanting to play more Battlefield 3. Truth be told, I'm also enjoying Modern Warfare 3. I've played it for about seven hours now, and I realize that a lot of the frustrations I had with Modern Warfare 2 are gone. The call-ins don't seem overwhelming, there's no constant tubing. It's just plain and simple gun-play, and that's not a bad thing. Plus the level of polish is, as usual, superb. The controls feel tight and responsive. Everything is nice and neat and organized. Playing with my friends is simple. I have yet to experience any glitches. The two reasons I don't play this more is that I do enjoy the combined arms and methodical paced game-play in Battlefield 3 a bit more (or I'm burnt out on Modern Warfare? ), and my group seems to feel the same way. If someone puts out a game with Battlefield 3's game-play, but with Modern Warfare 3's level of polish, they will get my money in a heartbeat. Will draw for monies! Interested in having me doodle something up for you? Want a unique Facebook avatar, desktop wallpaper, mock movie poster, or just a pretty picture of your favorite fictional female? Shoot me an e-mail (dave@squishycomics.com) with the subject line "draw for me", and just a brief description of what you're interested in. We can hammer out the details from there.